IN THE days before Norodom Sihanouk, then 18, succeeded to the throne, a gust put out the sacred candles lit in the palace to mark the event. 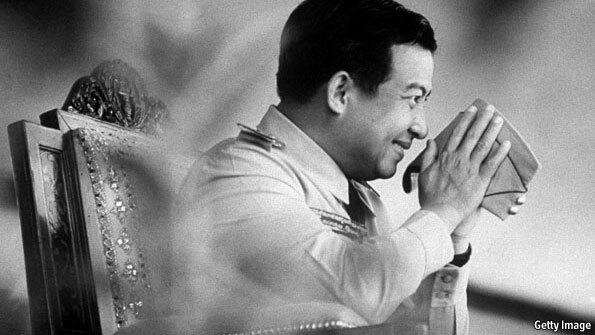 Courtiers tried to conceal the bad omen, but Sihanouk heard of it. At his coronation in October 1941, a God-King with a crown as tall as a temple, people thought he looked uneasy. If so, it was not about that. Sihanouk—as he always called himself, in the third person—was shocked that the French, Cambodia’s colonial rulers, had chosen him as king. He was disturbed, too, that they expected him to be a figurehead like his father, pliant and cuddly, a little lamb. True, he stayed giggly all his life, with a penchant for making films, playing saxophone, fast cars and pretty women. Elvis might have played him, he thought. When excited, betraying his French education, he would cry “Ooh la la!” in his high child’s voice. But underneath he was a tiger. “National dignity” was his motto. By that, he meant proper independence for “my Cambodia”. It began with independence for himself, breaking out from the stifling, insulating halls of the palace to tour among the peasants. Muddy ricefield salutations to “Papa King” gave him his taste for active politics. In an Indo-China roiled by post-colonial disputes and the shoving of the great powers, he wanted a dignified neutrality, and spent his career struggling to achieve it. On the one hand, he tried to stem the revolutionary communism seeping over the border from Vietnam; on the other he rebuffed attempts by America to make Cambodia its puppet. An accomplished charmer, he made friends with anybody who looked useful: China’s Zhou Enlai, India’s Nehru, Indonesia’s Sukarno, North Korea’s Kim Il Sung. He made allies even of the Khmers Rouges who destroyed his country. He also played, at his royal whim, whichever role seemed most effective: king, prime minister, or humble Khmer citizen-prince in pyjamas, cap and scarf. As a result, he survived to croon his love songs into elegant old age. Throwing off his handlers took time and guile. For his first “royal crusade”, ejecting the French, he travelled secretly to Paris in 1953 to petition for independence. Rebuffed there, he went on to Canada, the United States and Japan, genially lifting Cambodia out of its obscurity. When the French, besieged in the region, eventually gave in, his old cavalry instructor from Saumur remarked: “Sire, you have whipped me.” It was a pleasing moment. Yet he still seemed cast as a figurehead in his newly freed country—a fate tantamount, he said, to keeping Charles de Gaulle on the sidelines after the general had freed France. So he moved pre-emptively, renouncing the throne in 1955 to run in Cambodia’s first elections. Royal powers came in useful to suppress opposition parties, especially the newly formed Democrats. The peasants rallied round him, and he became prime minister. His country, he proclaimed to the world, was moderate and modernising: new hospitals, new schools. It was neither communist nor capitalist, but “Buddhist socialist” with a feudal flavour. While neighbouring Vietnam and Laos plunged into civil war, Cambodia remained his green “oasis of peace” in which visiting dignitaries were regaled with fine French wine and musical numbers by the king himself. He was indifferent to the poverty of the countryside, the corruption of his officials and the spread of communist cells; his peasants he saw as disobedient children who needed to be put in their place. After one revolt, the heads of villagers were displayed in the capital on spikes. Meanwhile, his diplomatic neutrality was cracking too. As Vietcong in their thousands sought sanctuary from American firepower in the jungles of eastern Cambodia, he let them stay—and in 1970 his generals, with American backing, organised a putsch against him. Outraged at this treachery, he threw his support behind Cambodia’s communists (“Khmers Rouges”, in his dismissive phrase), giving them legitimacy at a stroke. In 1975 they seized power. Sihanouk, now immured in his palace under house arrest, became a symbol again: a useful man to make occasional smiling tours of the collective farms while a quarter of the population perished. Five of his own children, out of 14 by several women, were killed, as he waited for the Khmers Rouges to “spit him out like a cherry pit”. They never did. When Vietnamese forces toppled the Khmers Rouges in 1979, he fled into exile. His old friends, the Chinese and North Koreans, both sheltered him. In Pyongyang he had the run of a 60-room palace; in Beijing he feasted with Deng Xiaoping on croissants fresh from Paris. After the Vietnamese had left Cambodia and the UN had brokered peace, he returned in 1991 with a squad of North Korean bodyguards, convinced his rapturous people would want him to rule again. They did, but as the figurehead he had never wanted to be. “Papa King” was now checked by a strongman, Hun Sen. From the sidelines, he chattered on. Even after his abdication in 2004 he ran a blog to instruct his people, and an online commentary in French on how the country was doing; and on his website the black-and-white slideshow of his reign went on flickering back and forth, until the fade.